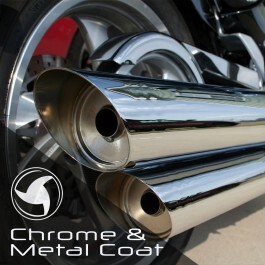 Ultimate Nano Coat v3 applied on bike chrome and metal parts will keep them shiny, rust free and very easy to clean for at least 1 year with no re-application. UNC v3 is a permanent nano coating for bare metal. Works on any type of metal, ferrous or non-ferrous. A single layer of this product stops bare aluminium from oxidising. UNC v3 can be applied in multiple layers for increased durability. We recommend to leave at least 12 hours between the layers.